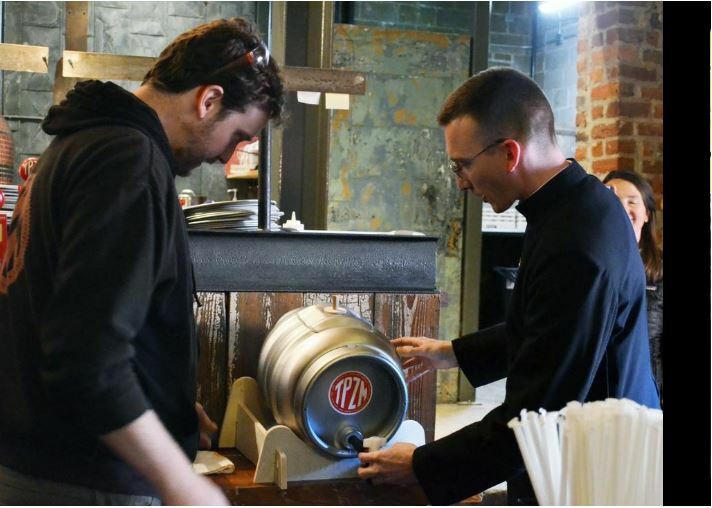 PETERSBURG — It’s not every day that you hear of your local priest blessing his own beer, but that’s exactly what happened Tuesday night at Trapezium Brewing Company, located in Old Towne. For the past year, Fr. Brian W. Capuano has been working with Trapezium Brewing Company to brew his own beer. The bourbon barrel brown ale was released during a special event on Fat Tuesday. Fr. Capuano won a Brewer for a Day contest in 2018 that Trapezium held, and so he got to make his own beer. “James Frazer, the brewmaster, was like ’Well, let’s just start with this, what’s your favorite beer on the menu? Which is the brown,” he explained. The afternoon kicked off with Fr. Capuano tapping the firkin at 5 p.m. Then, at 6 p.m., he began the blessing of the beer. After the blessing, the church choir performed a serenade. “Beer was traditionally brewed as an alternative to water. And also as a replacement food. So, the monks in the early days would often drink beer or ales as a way of fasting,” said Fr. Capuano, explaining some of the reasoning behind having the beer release on Fat Tuesday. The blessing of the beer took place alongside a prayer. As Fr. Capuano began his blessing, he encouraged everyone to drink responsibly and reminded the crowd that he would be hosting confessions the next morning. “Father Brian’s” beer was sold on draft and in 22 ounce bombers to go. A portion of all proceeds went to St. Joseph Catholic Church to help their stained glass window restoration project. For more information on Trapezium Brewing Company, visit www.trapeziumbrewing.com. Lindsey Lanham may be reached at 804-722-5155 or llanham@progress-index.com.